Was also detached as a teamster/ambulance driver. Mason was born 31 December 1842 to Joshua Davis and Kisiah Stanfield. 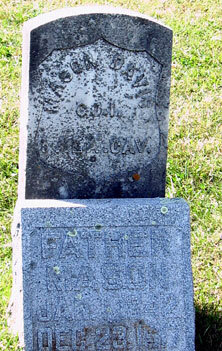 He was the brother of Jesse Davis and Robert Davis, also members of the First. He married Christen Ann Young on 20 November 1870 at Blue Earth Lake, MN. They had two children: Ida Lucinda and Gerome. After Christen's death, Mason then married Emma Jane Anthony and they had five children: Jasper Newton, Lamuel, Grant E., Ettie, and Nettie. Mason died 23 December 1917 in Janesville, MN. Picture submitted by RB Hall & MS Gallea.